Bananas are portable, low-calorie and easy to digest, making them a good food choice for almost everyone. These delicious fruits are packed with vitamins and minerals and contain no cholesterol or sodium. Whatever size of banana you choose, you're getting a healthy snack. Bananas are an excellent low-calorie, low-fat snack. Medium bananas, 7 to 7 7/8 inches in length, have 105 calories but only .39 g of fat. Large bananas, 8 to 8 7/8 inches long, contain 121 calories and .45 g of fat. Medium bananas contain 26.95 g of carbohydrates, of which 3.1 g are fiber and 14.43 g are total sugars. They also have 1.29 g of protein. Large bananas have 31.06 carb grams; 3.5 g are fiber and 16.63 g are total sugars. Large bananas contain 1.48 g of protein. 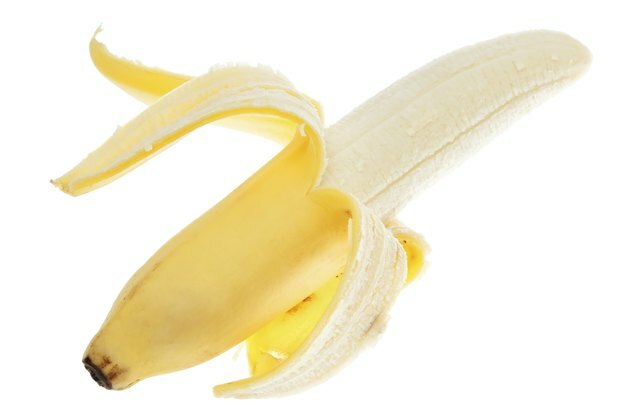 Since bananas contain more quickly digested carbohydrates than other fruits, diabetics may need to limit their banana consumption. Ask your doctor or dietitian for advice. Many people include bananas in their diet because the fruit is a good dietary source of potassium, a mineral necessary for the proper functioning of the body's electrical system. Both medium and large bananas are considered high-potassium foods. Medium bananas contain 422 mg of potassium, while large bananas have 487 mg.
A medium banana also supplies 6 mg of calcium, 10.3 mg of vitamin C, 32 mg of magnesium and 26 mg of phosphorus. Large bananas have 7 mg of calcium, 11.8 mg of vitamin C, 37 mg of magnesium and 30 mg of phosphorus. Both sizes of bananas have only 1 mg of sodium and no cholesterol.